Scientific studies about the efficiency of Qigong face a double challenge. For one thing, the cultural background of Qigong leads to a specific view of the human condition, which in part conflicts with the Western view on the human body, which lies at the foundation of “modern” medical research. An additional problem is that scientific standard methods of medical research, which determine today’s Qigong research, are to some extent unsuitable to capture typical aspects of Qigong, due to the Western image of medicine and its rootedness in a distinct research tradition. The traditional sportsman’s saying “mens sana in corpore sano” (a healthy mind in a healthy body) underlines – beneath the idea of a connection of mental and bodily health – a basic distinction of body and mind. Western medical science – following the Enlightenment tradition of the strict separation of body and mind – consequently struggles with the comprehensive (often referred to as “holistic”) conception of man in traditional Chinese medicine and the related concept of Qi as life energy. Western medicine deals with possible connections of body and mind/psyche either under the headline of psychosomatics or – nowadays increasingly popular – in neurobiological research. Both try to explain a connection which has to exist somehow, for it becomes visible when one observes living beings – for example grieving humans sometimes become physically ill without there being a traceable bodily reason for this illness. This obvious connection has to be scientifically re-established in the West with its cultural history of separating body and mind following Christian religion and the Enlightenment – it cannot simply be accepted as such. Traditional Chinese Medicine, in contrast, has no need for establishing this connection, as the separation seemed unnatural in the beginning. It was thus never made the way it was done in the West and does not need to be overcome. This epistemological problem becomes practical in the field of physical education and movement therapy. – Western physiotherapy roots in the leitmotif of physical education/physical toughening; gymnastics are moving action. This in turn bases on the idea of shaping the body according to a picture provided by the mind, i.e. by a willed (muscle) effort. An assessment of bodily deficits (Where are the weaknesses?, How can I eradicate them?) already forms the answer, the therapy. Guiding principle is the subjection of the body by the mind, as it is practised until today in body-building and in fitness studios, but also in the realm of the beaux arts as e.g. classical ballet. The body becomes a means toward the best possible evolvement of the mind. Concerning the outward appearance, these Western practices are very rigorous stretching exercises supported by dragging and pulling the sinews (which were judged as being “too short”) combined with dynamic bouncing and repetitive and accurately counted muscular exercises (when parts of the body are judged as “too weak”). All in all, this results in a military image, mindless and yet ruled by the mind. (As a possible reference for this “ideal type” see the gymnastic exercises of the German “Turnvater Jahn”). This approach towards body work is fundamentally different to both the traditional Chinese practices of Yangsheng and their modernized versions, which today are referred to under the common term of “Qigong” – working with the Qi. They follow the concept of the – comparably “passive” – flow. Flowing water indicates the way of the exercises and at the same time symbolizes the harmonized unity of body, mind and breath. Group A (pill A) – Group B („placebo“). Group A (pill A) – Group B (placebo) – with the participants not knowing which group they are in. Group A (pill A) – Group B (placebo) – participants and researchers do not know who is in which group during the trial period and the first evaluation steps. 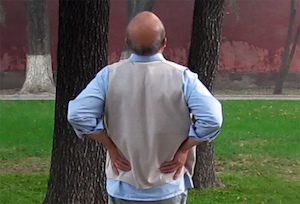 Naturally, this is a simplified account, but it provides enough background to point out some problems concerning the research and scientific study of Qigong. First of all, there is a practical problem – Qigong is no pill and requires active participation, which in case of a long-term study over several years would mean that participants would have to invest many hours on a regular basis. If too many participants dropped out, this would endanger the quality and the scientific significance of the study concerning health effects (while at the same time providing a hint towards what could be seen as the real problem of Qigong as a means of healing, even though its alleged effectivity could perhaps be proven scientifically). One problem here is that in the phase in which the participants of the study are still learning the choreography, i.e. 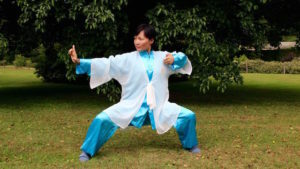 the external movements of Qigong, they are not able to do anything, which could be termed “Qigong” according to Qigong’s own internal standards. Instead of being able to do Qigong, in a sense of internal body work with the Qi (meaning at least a basic coordinating body, mind and breath), the participants would do a kind of gymnastics with Qigong movements. Any difference concerning healing success would therefore just be a consequence of the difference in movement patterns and would not be based on the specifics of Qigong, which are the only reason to distinguish between Qigong and other gymnastics in the first place. Short-term studies covering a few months only are simply not able to establish scientific evidence concerning the specific aspects of Qigong. – However, it is these meditative, mental and energetic aspects, on which the healing myth of Qigong is based. Concerning this point, a short-term study which would provide evidence that Qigong is more effective than gymnastics would merely prove that it is better to pretend to be moving energy back and forth within one’s own body while doing gymnastics than simply doing gymnastics without this (delusive) imagination. This leads us to the problem of placebo/blind studies. There are some people who practise Qigong for the first time and instantly feel energy everywhere which they think they are able to lead and manipulate, just because they know they are doing Qigong or because they are intrigued by the idea of their energetic giftedness. How can I eliminate these effects? It would be possible to create placebo studies in this artificial way, but blind studies are not possible. Strictly speaking, this is already a problem with studies about the positive effects of health gymnastics – you always know when you are exercising, you know that you are doing something. This aspect alone could answer for the increasingly valued emotional “healing effects” of both types of movement therapies: You feel better, because you did something. Furthermore, Qigong is a process, not a method. Not only, that you cannot simply throw in the pill, the pill is also changing over time. There is no “theory of Qigong”, which canonises the healing movements once and for all. The requirement of Qigong for its practitioners to acquire the exercises, to internalize the processes – which does decidedly exclude mere copying or imitating – is one of the distinctive aspects if not the distinctive aspect of Qigong, which puts Qigong in opposition to gymnastics. The demand upon the gymnastics instructor is simply to present the same exercises in a non-changing manner and – if required – to add new ones from time to time. The participants in the course exercise accordingly. – The demand upon the Qigong instructor is to evolve continuously, to refine the execution of the movements, to fill the movements and the principles with life. Each and every stagnation in this development, every established method put down in stone fails the internal standards of Qigong. – The dream of the sports pedagogue is thus the nightmare of the Qigong master. This processual quality of Qigong and the indispensable development of the practitioners makes Qigong to a degree inaccessible for traditional methods of scientific research, which look at a defined subject or at the underlying mechanism of a chemical formula. The separation of theory and practice, which is unknown to Chinese philosophy, seems somehow to be a prerequisite for the theory-driven scientific measurement of the practical success of a method under experimental circumstances.